How Kaggle works is that a company approaches them with a data set and instructions on what they want to extract from that data. Kaggle then uploads the data and instructions to their website where anyone can download it. Kaggle awards a cash prize, which can reach up to tens of thousands of dollars, to who can develop a model that beats the current software. In a way, Kaggle competitions are similar to Galaxy Zoo in that they use crowdsourcing. But, in other ways, it’s different explained Harvey who is a postgraduate student at the University of Edinburg in Edinburgh, UK. Harvey, with help from colleagues in the US, Netherlands and Portugal, launched the Kaggle competition “Observing Dark Worlds” in October 2012. The competitor who submitted the best overall code was handsomely rewarded a $20,000 prize. Competitors mined through synthetic images of galaxy clusters that Harvey had simulated. The images were not just of galaxy clusters, however. 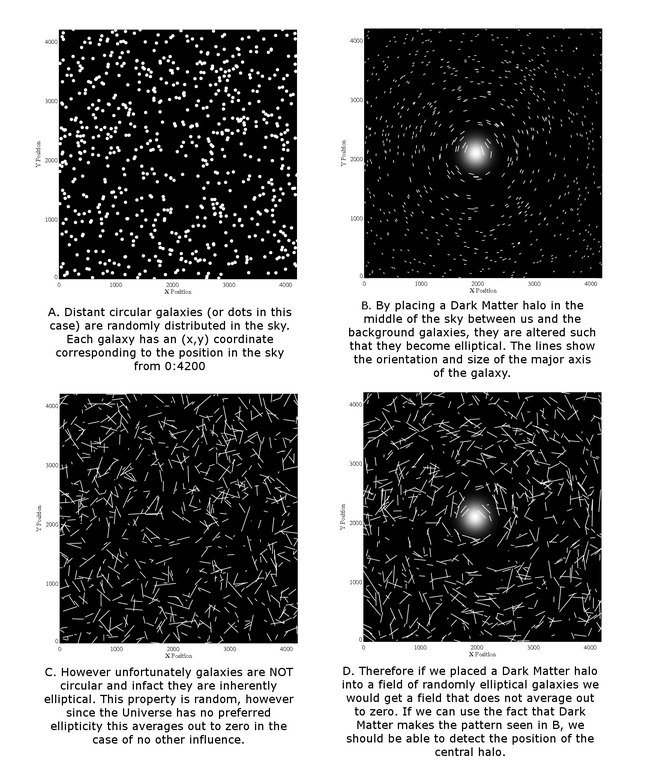 They included the gravitational footprints of dark matter halos. Dark matter halos are large collections of dark matter that astronomers think encompass galaxies and galaxy clusters -- like a bubble surrounding a pocket of air. If light from a distant object passes too close to a galaxy or cluster of galaxies, the gravitational tug from the dark matter halo surrounding that galaxy or cluster (as well as the visible matter) will bend the light’s path. This process is called gravitational lensing and distorts images of objects as they appear from Earth. A similar trick of the eye occurs when light bends, or refracts, upon entering water, causing submerged objects to look larger. Examples of images in the Kaggle competition "Observing Dark Worlds." Captions and images courtesy of David Harvey of the University of Edinburgh. Some times, gravitational lensing will make galaxies appear more elliptical than they already are, and it is these distortions that Kaggle competitors were after. Their goal was to develop an algorithm that could reconstruct the positions of dark matter halos from simulated images of clusters of galaxies. A scoring system helped competitors monitor the accuracy and progress of their models. The two-month-long, comparatively popular competition to other Kaggle challenges attracted 357 competitors who worked from synthetic images of 120 simulated galaxy clusters. The top three algorithms, which Harvey and his colleagues discuss in their recent publication in the journal Astronomy and Computing, improved upon one of the benchmark gravitational lensing software, LENSTOOL, by 30 percent. Harvey said that although the top codes that came from the Kaggle competition are an improvement, they are not ready to replace tools like LENSTOOL, yet. One of the reasons being that the code is based from simulated images instead of the real thing. Moreover, the codes sometimes achieve the desired end result but through a process that would not necessarily work on real data. “The extra work between the end of a competition and getting algorithms through takes lots of time and effort and collaboration… I’m not sure if the algorithm will turn into something,” said Harvey who explained that the contacts he made from the competition were as equally important as the code he and his colleagues gained. “It’s about getting contacts as well as algorithms,” he said. Harvey recently finished another crowdsourcing project with Galaxy Zoo, the data from which he hopes to use to develop algorithms that classify galaxies. Dark Matter is nothing but aether which is proved to be existing in the published paper "Michelson-Morley Experiment: A Misconceived & Misinterpreted Experiment" available at journal site http://www.indjst.org/index.php/indjst/article/view/30182. Besides Big Bang Theory including Cosmic Inflation has been mathematically, theoretically & experimentally proved as baseless in the published paper "Experimental & Theoretical Evidences of Fallacy of Space-time Concept and Actual State of Existence of the Physical Universe" which is available at the journal site at http://indjst.org/index.php/indjst/issue/view/2885. Absence of Black Holes means Stephen Hawking has finally accepted that there are serious problems with both Newton's perspective of Gravity & Einstein's General Theory of Relativity because both require Black Holes at the center of the galaxies. As for your other reference, the Indian Journal of Science and Technology is not considered a reputable journal. Interesting thing can be seen, watching collision of galaxies known as the Bullet Cluster. Maybe this is the proof of that dark matter exists. 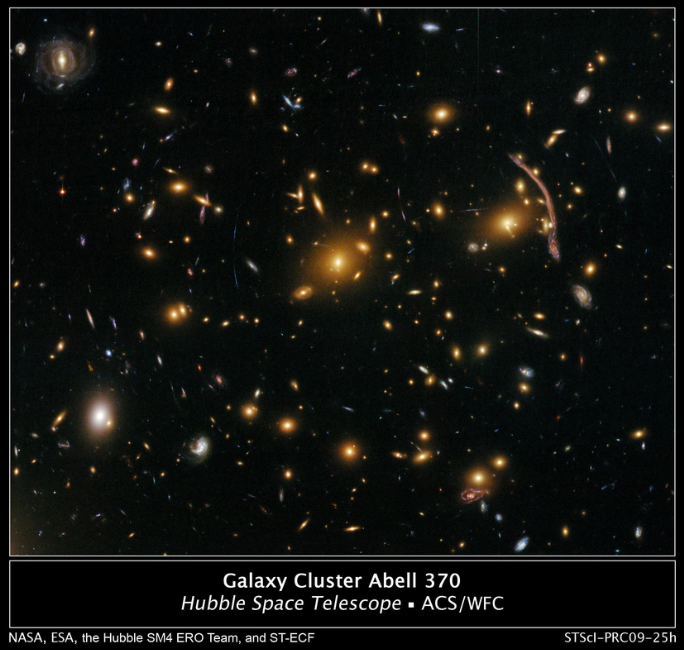 Within the cluster there are galaxies and gasses. During the collision, the gasses slowed more than the galaxies. Measurements showed that large amounts of mass that that should have fallen behind with the gasses continued ahead with the galaxies.